Veteran blogger and prominent social media personality Mark Lopez burned down a supporter of Maria Ressa for idolizing and defending the Rappler CEO who is now facing a controversial tax evasion case. 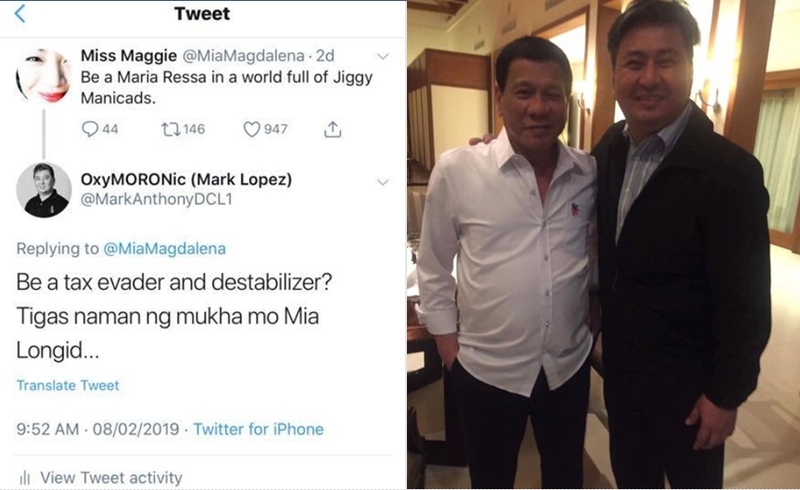 Twitter user Miss Magie who was identified by Mark Lopez as Mia Magdalena or Mia Longid posted the following message "Be a Maria Ressa in a world full of Jiggy Manicads." The statement of Miss Maggie on Twitter, Mark Lopez responded by burning down the Duterte critic as he tweeted "Be a tax evader and destabilizer?" Tigas naman ng mukha mo Mia Longid." On Facebook Mark Lopez lectured Mia Longid further by revealing that Mia Magdalena or Mia Longid is the alleged registrar of Brent International School Baguio and considered to be one of the PABoost squad together with Jover Laurio and Gideon Peña. Itong si Mia Magdalena or Mia Longid na registrar ng Brent International School Baguio ay isa sa mga PABoost squad kasama ni Jover Laurio at Gideon Peña. Netizens also reacted with the statement of Mia Longid and how she was burned down by Mark Lopez. Jean Racelis Whoever wants to be a tax evader na may kaso at nag-bail lang? Malinis ang NBI clearance gusto dumihan! Magtiyaga na lang ako sa sahod na tama lang sa kaya kong bayarang tax! John Vincent Parungao Agbunag I'll be a Freakin' Fafa Ricardo Jiggy Manicad in a world full of Maria Ressa na wanna-be Aiza Seguerra kaya lang hindi naman talaga kaya. Gerard Fontesora Maria Ressa has a warrant of arrest and is on bail, and this school registrar want people to be like Ressa? Hahahaha! Jusko, paano na mga students ng Brent? Corrupted na din sila! Roland Macabata pabobo na ang mga elitista..inuuna kasi hitsura..pero ang social climber na pab and ressa huling huli. Bakit di kaya sila nabubully ng mga elitista.